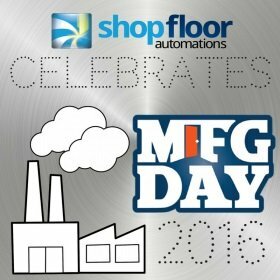 MFG Day 2016 Wrap Up Blog - Shop Floor Automations Inc.
To celebrate this day, we share some insight below from a few of our customers and experts from this field. 1) Workers in a manufacturing-related job can make about $15,000 more per year than most other job fields. 2) For every dollar spent on this industry, the economy gains an 81 cent profit. 3) Organizations like Workshops for Warriors (WFW) are able to thrive while helping those who served our country get training and jobs in the manufacturing field. PTSD and other factors can make it difficult for veterans to return to the workforce, and WFW gives them a great venue to explore a new career. As a huge “PS” to this piece – we also have a 10% off promo for our entire store all this weekend as a “thank you” to shop floors everywhere (use the code “mfgday”). Share with Shop Floor Automations what you are doing for MFG Day by using the hashtag #MFGDay16 on Twitter and including @SFA_inc in the conversation. Shop Floor Automations, an official endorser of MFG Day, has been a leader in solutions towards manufacturing shop floor OEE and Continuous Improvement since 1998. Call us today for your shop floor needs at (877) 611-5825.